The major phases of this lunar journey are noted above, and you may want to note these in your Moon Chart or journal. This is a special month in the Celtic Wheel of the Year, as we welcome Samhain in the Northern Hemisphere and Bealtaine in the Southern Hemisphere. There are four special days, celebrated as Fire Festivals, in the Celtic Wheel of the Year: Samhain, Imbolc, Beltaine and Lughnasadh. They fall on the cross-quarter days of the year, which are defined as the midpoint between a solstice and an equinox, and vice-versa. These dates divided the year into two parts, the "dark half" beginning at Samhain (essentially marking the New Year and the arrival of Winter) and the "light half" at Bealtaine (marking the arrival of Summer). 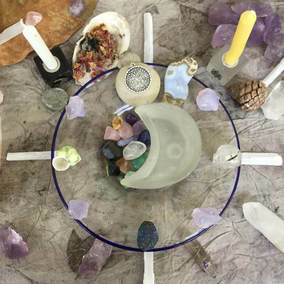 There are many elements to Samhain celebrations, including honouring the past and our ancestors, honouring The Crone energy of the coming winter, divination, celebration and the deep work of meditating / reviewing our own past year and the lessons learned, which will help us determine how we can move forward in the coming year. History shows that my Celtic ancestors were not necessarily rigid about marking the seasons or the cross-quarter dates. For instance, Samhain ― which means Summer's End in Irish Gaelic ― may have been celebrated when the final harvest was completed rather than the actual cross-quarter date. And this is an important point for us all. Yes, we have traditional rituals, rites, ceremonies, and celebrations for each of the eight sabbath in the Wheel of the Year. . . but remember to live the as you experience the seasons, connect with them, entrain with their energies. Celebrate your own way. The Celtic Wheel of Life came down through history from the ways and beliefs of the people of Northern and Western Europe, which has four sharply defined seasons and growing cycles. But where you live, it may be different . . . maybe you have a rainy season rather than a snowy season. . . maybe Spring arrives for you in May, while for others it comes as early as February. . . maybe your growing season is brief. Raise the awareness of all your senses and observe how the seasons transform throughout the year where you live. Over time, because of the variances in the "true" dates, traditional dates were adopted and many now choose celebrate at those times: Samhain on November 1st, Imbolc at February 1st, Bealtaine on May 1st and Lughnasadh on August 1st. And remember that for the Celts, the day started in the dark at sunset the day before. So, for example, Samhain celebrations would have started the evening of October 31st. This year, for those in the Northern Hemisphere, “true” Samhain falls on November 7 at 01:15 UTC (November 6 at 6:15 PM here in Vancouver). 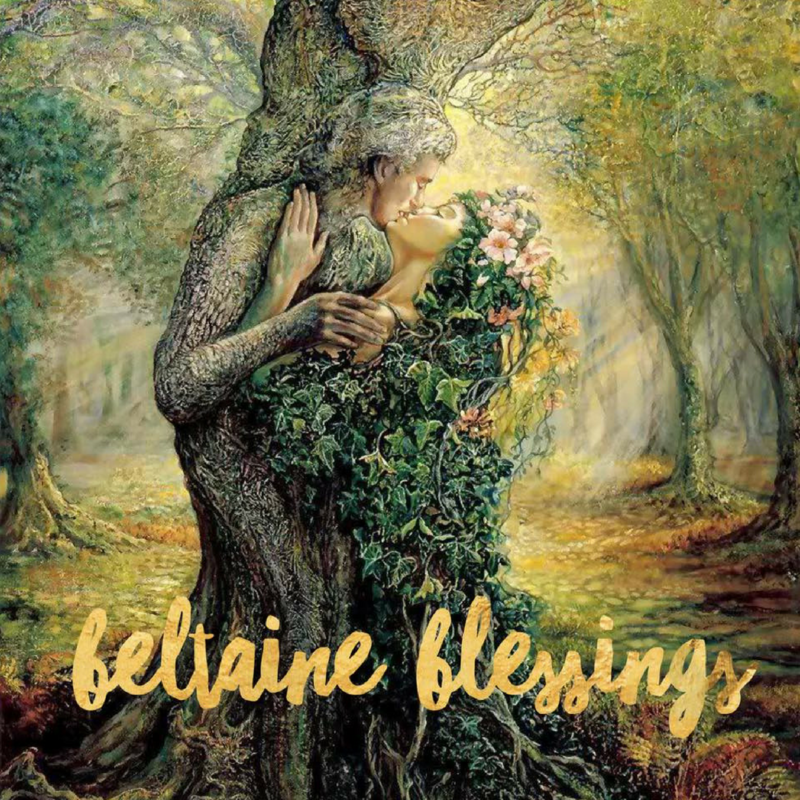 And if you are in the Southern Hemisphere, on this date you will be celebrating Bealtaine, the fire festival celebrating the beginning of Summer, the light half of the year and the fertility of the nature. You can celebrate on either day, or both! 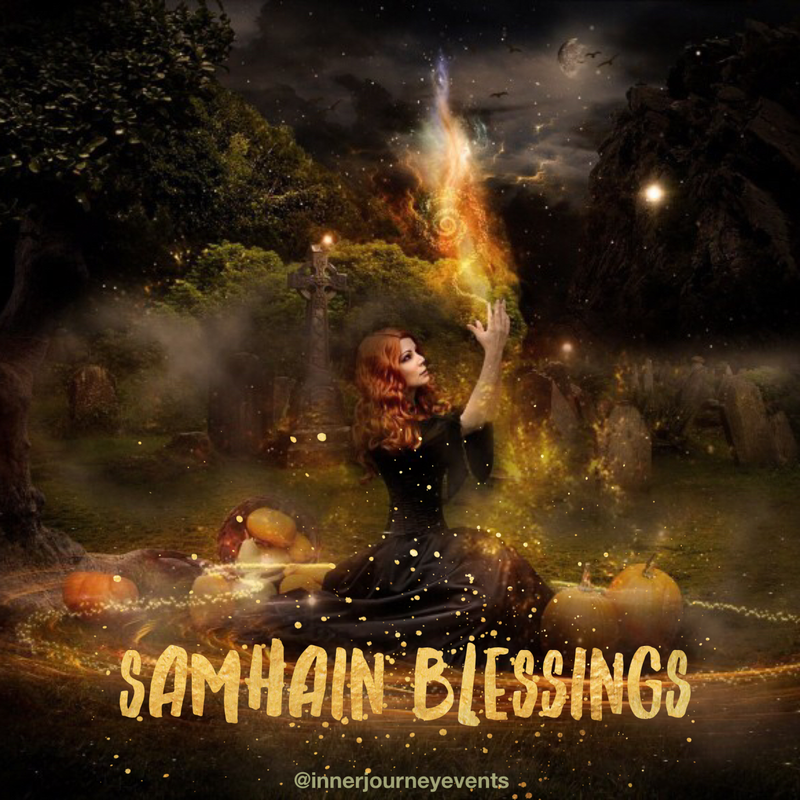 ​Follow the Inner Journey Events blog for how to celebrate Samhain (or Beltaine!) with magick, ritual and more. The New Moon of October 19th arrives in the sign of Libra, a Cardinal sign signifying initiation and aligned with the cerebral element Air, which can bring change and inspiration or knock us down with heavy gusts! We enter and depart from the world with Air, from our first inspiring breath to our last expiring breath. Libra is represented by the scales of balance, the only inanimate symbol in the zodiac many of us are familiar with; all the rest are represented by animals or humans (and even a few gods and goddesses). But that doesn't mean it's a cold sign, devoid of emotion. Just the opposite, in fact, as Libra is ruled by Venus, the Goddess of Love. So, Libra asks us to celebrate (or at least consider!) relationship and everything associated with it, such as harmony, cooperation, romance . . . and the beauty of the Goddess. 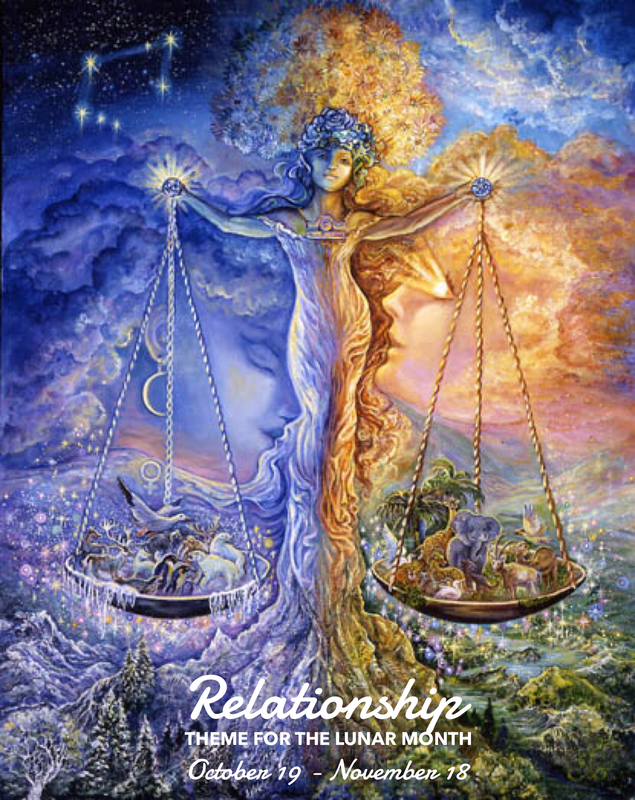 Libra asks us to consider what it means to be in Right Relationship, how we relate to others. This New Moon is opposite Uranus, the Great Awakener. Be prepared for a big awakening or a major shift change, how you choose to experience your relationships from now on . . . with loved ones, with your Self and with Mama Earth. This is what 18th Century Quaker John Woolman called Living in Right Relationship . . . transcending selfishness and acting for a sustainable greater good. So, no surprises, the theme for this lunar month is Relationship. If this theme works for you, wonderful! If not, choose another theme that resonates . . . perhaps inspired by your Dark Moon reflections on last month’s journey. So many influences at this time of year! The New/Dark Moon brings us the deep feminine energy of the Crone, the wisdom-keeper, the blood-mystery of menopause, the wise blood within. The Crone can be represented by Dark Mother goddesses such as Hecate, Hel, Cerridwen, An Cailleach, Kali and more. 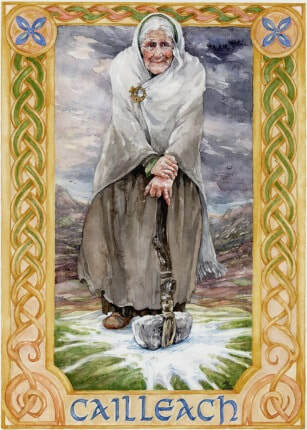 This is strengthened even more by the approach of Samhain, the time of Winter, the time of the Cailleach. Embrace her deep wisdom as you explore Relationship this month. These Dark Mothers are the Goddesses of our transitions, the liminal moments between life and death, between the conscious and unconscious, between the shadows and reality. They are creation and destruction. And they are your allies in the last waning moments of the solar year, as we transition to the Dark Half of the year. Their darkness is not just shadow, but power and knowledge and deep intuitive insight. The First Nations expression All My Relations reminds us that we are in community, and not just with our fellow humans but with everything on this planet and in this Universe and in the Otherworld(s). . . Spirit, the Star People, the Standing People, the Stone People, the Plant People, the Ancestors and more. For this month's theme of Relationship, take some time to consider ALL your relationships ― with the Self, with loved ones, with your Ancestors, with Spirit, and with Mama Earth. Take time to consider how you honour and respect and nurture all these relationships, and where you might be out of alignment, out of Right Relationship. ​Journal your observations, feelings and what you learned about Relationships in this lunar journey that began with the New Moon in Libra, and revisit your thoughts at the Full Moon in Libra on Saturday March 31st 2018, which is also a Blue Moon!